If you frequently communicate over the Internet using Email or instant messengers, you’ve likely seen or used image-based symbols known as emoticons and emojis. Commonly referred to as “smiley’s”, there is some confusion when differentiating between the two. It is important to know that emoticons were invented and used before emoji. However, emoticons and emoji were both created to help facilitate tone of voice, emotional texture, and humanity into online conversations. The inception and adoption of emoticons into the online lexicon has generally been credited to Scott Fahlman, a computer science student at Carnegie Mellon University. In September of 1982, Fahlman used “:-)” and “:-(“ on his university’s electronic message boards to differentiate between serious and joking statements made online. While Fahlman modernized the usage of textual “emotion icons”, he was not the first person to realize that characters on a keyboard could be combined to produce a series of emotional facial expressions. 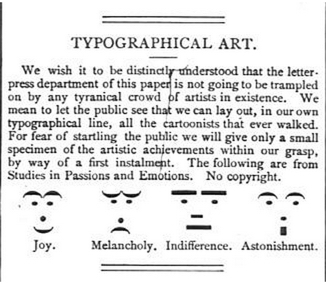 In 1881, Puck Magazine published an article entitled “Typographical Art.” This piece showcased several emotional expressions that could be represented by combining certain typographic characters, sort of like a predecessor to digital trends we see today. Early emoticons–people were able to recognize the creative visual aspects of typography long before they were used in common practice. Emoji are from the Japanese “picture characters” and refer to a large library of standardized symbols and icons used to express an idea or emotion over electronic communication. They were first released in 1999 by a man named Shigetaka Kurita. He designed them for Japan’s predominant phone carrier DoCoMo (“Do Communications over Mobile”). Emoji were created at a time when picture messaging on phones was new and popular. However, it was also costly and difficult to send these typically large files, and in response emoji were created as a digitally lighter alternative to sending picture messages. From humble beginnings, emoji began as a set of 176 12×12 images that would lay the foundation for emoji everywhere. 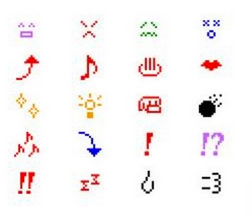 These are some of the very first emojis, created in the late 1990s. Emoji have been incredibly successful and have been standardized across multiple computing platforms using Unicode, which is the character set used by most operating systems today. The Unicode Standard covers over 110,000 key/text characters and is run by a collective of large companies that comprise the nonprofit Unicode Consortium. Getting an emoji character to be standardized as part of Unicode’s library is an incredibly long and drawn out process, however. 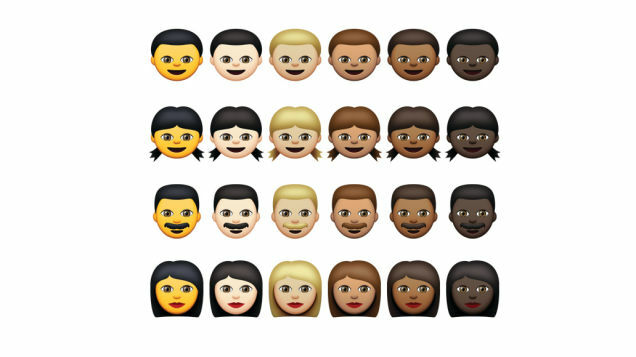 Sometimes people complain that emoji programmers are racially insensitive for not providing a more racially diverse selection of emoji characters to choose from; in reality there are racially diverse icons that have been logged and designed but are still waiting to be standardized. In 2010, hundreds of emoji characters were encoded as part of the Unicode 6.0 specification. As of Unicode 7.0 there are roughly 800 emoji. Emoji have grown and adapted to accommodate a global and diverse communicative landscape online. Software has to specifically support and read emoji, and individual companies have their own interpretations of what emojis should actually look like. In other words, emoji characters don’t have to look the same everywhere they’re used. The Unicode standard simply offers a description, a code, and a basic pictograph. It’s up to OS creators to customize the emoji as they see fit. Even though the Unicode standard would seem to imply that emojis should be the same across the board, this is not necessarily true. The Unicode standard is more like a general skeleton or placeholder to be filled in by the specific operating system in use. Unicode standardizes a code point designating emoji symbols, but does not demand a uniform visual representation across all operating systems. Before emoji, any text-based representation of a face or other expressive character was commonly referred to as an emoticon. After emoji went live in 1999, images of faces, as well as iconic pictures of food and animals, were suddenly available to send over a wireless network. Soon emoji were adopted into more accessible means of electronic communication, and people could send and receive text-based emoticons and image-based emojis simultaneously. Emoji literally means, “picture character” and as such it represents a vast array of icons that extend beyond emotional expression. Emoticons, on the other hand, are identified as online symbols that depict emotive or expressive symbolism. Therefore, some emoji are emoticons, but not all emoticons are emoji.
? is both an emoticon and an emoji.
? is an emoji but not an emoticon. Independently created at the same time as emoticons, kaomoji are essentially the Japanese version of emoticons. Since Japan uses a different typographic set of characters to communicate via text, different types of kaomoji are possible, such as ಠ_ಠ or (´• ω •`). A various assortment of emoticons created using a Japanese keyboard. The word kaomoji is formed by two different words, kao = face, and moji=text/character. Some people claim that emoticons are Westernized kaomoji, and vice versa. Regardless of who thought of it first, we can all agree that kaomoji and emoticons make online interactions more fun and immersive. Emoticons, kaomoji, and emoji are transforming the landscape of electronic communication. While text-based emoticons will always be an accessible and democratic form of transmitting tone or expression online, emojis are a global sensation that will continue to spread, popularize, and standardize. Twitter, for example, has used emojis billions of times. 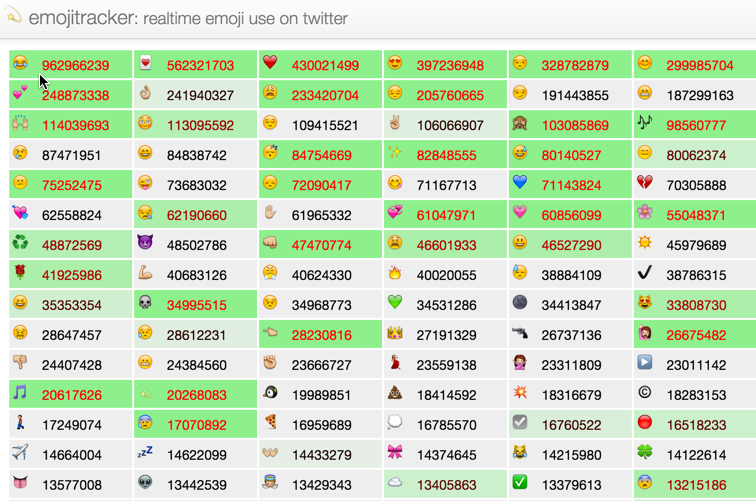 Emojitracker.com provides real-time updates tracking emoji use on Twitter. This goes to show that images and text-based icons have effectively become a part of our global language. We should embrace these changes as evolutions in language as opposed to deviations from it, and expect to see more emojis incorporated into our mobile and communicative electronic devices.